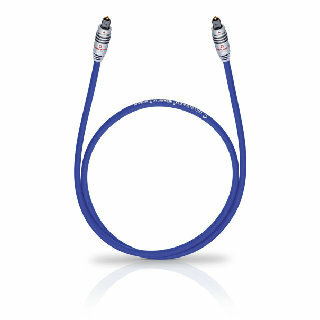 Enlarge Optical Digital Cable, Premium Class. Absolutely quality-built fibre-optic cable for optical-digital audio connections between individual home-cinema components. The digital cable´s patented design with 217 individual fibre-optic conductors made from special polymer optical fibres achieves highest luminosity and allows data to be transmitted at rates of up to 125 Mbps (megabit/second). The standard for the transmission of multi-channel sound formats using optical TOSLINK interfaces only specifies transmission rates of 12.8 Mbps! Preassembled with the TOSLINK "XXL Series 80 CO" plug specially configured for this cable.